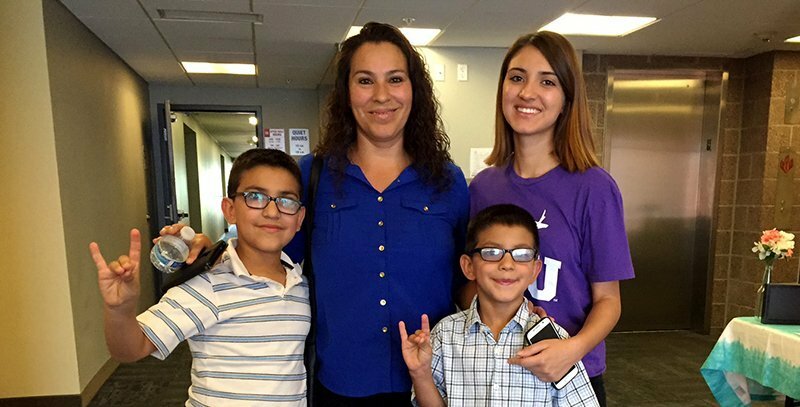 Andrea Rascon Ayana (top right) was accompanied by her mother, Irene, and brothers, Leonardo (left) and Leonel, Friday when she moved into Sedona Hall. Andrea Rascon Ayana was so thrilled about attending Grand Canyon University that she signed up for three official tours, spent a night on campus and visited several other times during her senior year at Glendale High School. A Students Inspiring Students participant, Andrea is the first in her family to attend college. She’s been packed since June, two months before Move-In. She participated in Welcome Week events daily, including the Canyon Cooldown. And she met her roommates at Sedona Hall days before her Friday move-in date. “I just want to start already!” she said before Welcome Week arrived. She’s a smart, competent go-getter, an overachiever with an impressive high school record. But even with all her preparations, Andrea was caught off guard by a flood of feelings that washed over her during the annual Ignite ceremony, a spiritual night of worship music and prayer that is a Welcome Week highlight. The sheer number of students – several thousand – who participated also impressed her, as did the fact that they attended by choice. Andrea is the first in her family in a number of ways. She’s the oldest child and the only daughter. She’s the first to learn English fluently, the first to receive a scholarship, and this week Andrea became the first in her family to attend college. 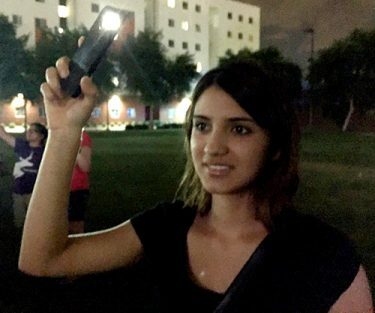 Andrea was choked up with emotion after the Ignite ceremony, one of many GCU activities she attended during Welcome Week. 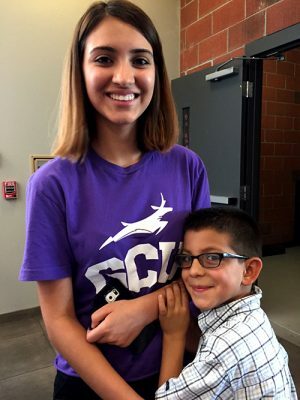 Thanks to GCU’s Students Inspiring Students program and Andrea’s stellar credentials, she is one of 100 local, inner-city high school graduates awarded a full-tuition scholarship to the University. 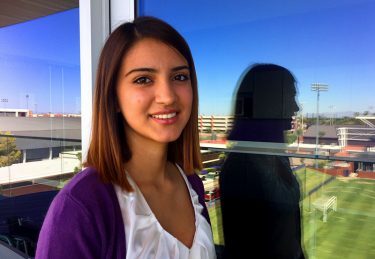 Under the terms of the scholarship, recipients receive academic assistance at GCU’s Learning Lounge, its free after-school tutoring program, while in high school. As part of their full-tuition scholarship, students then pay it forward by putting in 100 hours a year of mentoring and academic support at a Learning Lounge site while at the University to the next group of K-12 students behind them. Andrea, who loves biology as much as writing, honed her academic skills five days a week in the Lounge and spent four years writing and editing for “The Cardinal,” her school paper. She participated in Spanish Club, freshman orientation and the Students Against Drunk Driving club. She volunteered in the gift shop at a Banner Health facility and managed the girls basketball team. As the strongest English speaker in her family, Andrea often navigated medical information and other areas requiring paperwork. She also looks after her brothers, ages 6, 8 and 16. The oldest brother accompanied her to Canyon Cooldown. She is like a second mother to the younger two. “They’re my babies,” she said. A typical evening for Andrea after her extracurricular activities consisted of helping her brothers with homework, doing family chores and then completing her own homework, which often was interrupted by requests. Andrea will miss Leonel but knows it’s a short drive to Glendale. “I know it by heart,” she said. She manages so many things that her mother noted that, at GCU, Andrea would get a much deserved rest. It was her mother who encouraged her to live on campus rather than commute from home. On Friday morning, amid the blaring music of a marching band and a horde of volunteers, parents and students, Andrea’s family pulled up in a white pickup truck. Her mother, Irene, and two youngest brothers, Leonardo, 8, and Leonel, 6, came along, but her father had to work and her other brother had three tests in school. Andrea looked elated as she multitasked between handling the check-in process, explaining things to her mother, who doesn’t speak English, and keeping an eye on her energetic siblings. She was literally, at that moment, between her two worlds. The new GCU experience and all it offers lay before her as she stood in the loving embrace of a close family. “I am so happy I’m here, ” she said. The boys clung to her and her mother seemed torn between smiling with joy and feeling the enormity of Andrea’s departure from the nest. Andrea knows she will miss all of them, too, but she is close enough to visit them on the weekends. She is particularly excited about having her family visit campus on Family Weekend, scheduled for Oct. 6-8. And so Andrea officially began life as a GCU freshman, the first in her family to take such a large step. When it comes time, she hopes her brothers will follow.